his skateboard at the Tybee Island YMCA basketball court. They are going to build it and they're pretty sure people will come. They are going to build a skateboard park on Tybee Island because the young people want it, they have worked hard to get it and there are few places in or around Savannah where they can legally or safely skate. The Tybee Island City Council approved the project and a portion of the needed funds in August 1999. The council approved the park's location and design in May. The Tybee YMCA donated additional money and by the end of August skateboard enthusiasts will have a half pipe to call their very own. Tiffany Dennis, recreation director for the City of Tybee Island and director of its YMCA, said volunteers would start construction of Phase I of the skateboard park in late July. Phase I is the half pipe (see illustration). Phase II, a concrete slab, will be built as funds become available, followed by Phase III, consisting of various ramps constructed on the concrete base. Estimated cost of the three-phase project is $60,000. She said the City Council is considering a fourth phase that will include a walking track around the park. The City of Tybee Island contributed $10,000 toward the project, Dennis said, while the YMCA donated another $10,000 it raised through its annual gift campaign. Tybee skateboard enthusiasts raised an additional $1,000 through car washes, hot dog sales and other projects. "Tybee kids needed something to do," Dennis said, "and skateboarding is in." Until now, however, Tybee Island's skateboarders, like those in Savannah, have had a tough time practicing their sport. "There's nowhere to skate here," said 14-year-old Stephen Williams, a ninth grader at St. Andrews School. "Sometimes we go to Beaufort, sometimes we go to Jacksonville." Both cities have parks with facilities designed for skateboards. "I got busted (for skating) on River Street once," said Williams' 16-year-old brother, Andrew, an 11th-grader at Jenkins High School. The Williams brothers and 13-year-old Bennett Bacon said they were present when a friend was arrested for skateboarding on the Tybee Island pier. Tybee Island police chief Jim Price said he had no record of any skateboarder being arrested. He said the general prohibition against skateboarding in most areas exists to protect pedestrians and prevent the destruction of public property. He supports the skateboard park project. "A few people ruined it for everybody," Price said. "They were destroying benches and railings in the beach area and at the science museum. We don't allow skating in the parking lots because of the potential damage to pedestrians and vehicles, but we haven't made any cases against skateboarders this year or last. At this point, we just ask them to leave. They'll have some supervision and control at the new park. I think it's a good idea." Bennett and the Williams brothers acknowledge that people get nervous around skateboarders. "People think we are going to hit them and skate away," Stephen Bennett said. "I've never hit anyone who wasn't a skater, on River Street or anywhere else." All three boys are excited now that the often-discussed skateboard project has finally been approved. "I think it's pretty cool," Stephen Williams said. Dennis said Phase I construction should take no longer than two weeks. 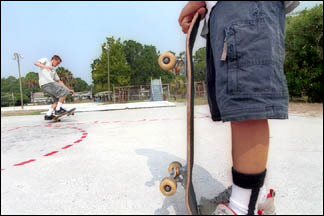 Like Tybee's swings, basketball and tennis courts, the skate park will be open to the public. Typical rules of safety and conduct will apply, she said, and skaters will use the park at their own risk. As the island's recreation chief and director of the YMCA, Dennis will run the park. Tybee skaterboarders will be the envy of their Savannah neighbors for some time to come. Savannah's Leisure Services Director Joe Shearouse said there are no existing public skateboarding facilities in Savannah and none planned through 2005. However, he said, the city's five-year leisure and recreation plan will undergo a comprehensive review this year using random surveys and public hearings. If there is sufficient public interest in a skateboard facility, Shearouse said, it could be included in plans for 2006 or later. Linda Sickler contributed to this report.